Hundreds of citizens staged protests in Armenia’s second largest city of Gyumri on Wednesday afternoon demanding justice in a mass murder case involving a Russian serviceman. Valeri Permyakov, a 19-year-old soldier at Gyumri’s 102nd Russian military base, was detained by Russian authorities late on Monday on suspicion of shooting and killing six members of an Armenian family in the city. A six-month-old baby is at a hospital in Yerevan recovering from stab wounds inflicted in the attack. The Armenian Prosecutor-General’s Office acknowledged yesterday that the case is within the jurisdiction of the Russian authorities even though the crime was committed in Armenian territory and all of the victims are citizens of Armenia. 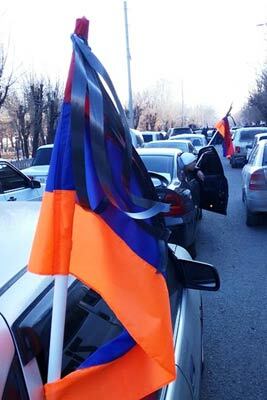 Many in Armenia feel the proceedings should be administered by Armenian law-enforcement authorities. Citizens in Gyumri today held several protests, including at the Consulate of Russia and the Russian military base, chanting “Shame On You” and demanding a full and thorough investigation of the case. Earlier, Armenian President Serzh Sargsyan said that the case was under his direct control and other officials gave assurances that the suspected criminal will stand trial in Armenia.